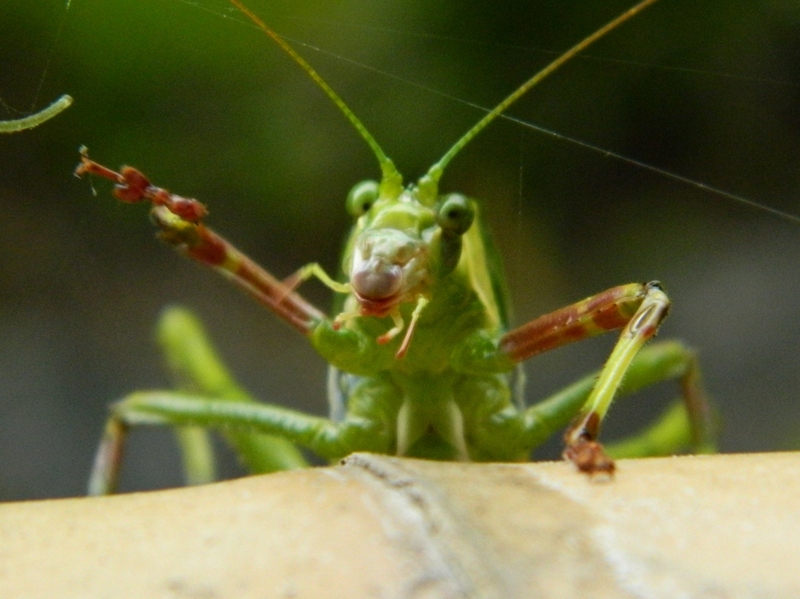 I had begun to think that the katydid was either a myth or that I was doing something wrong. 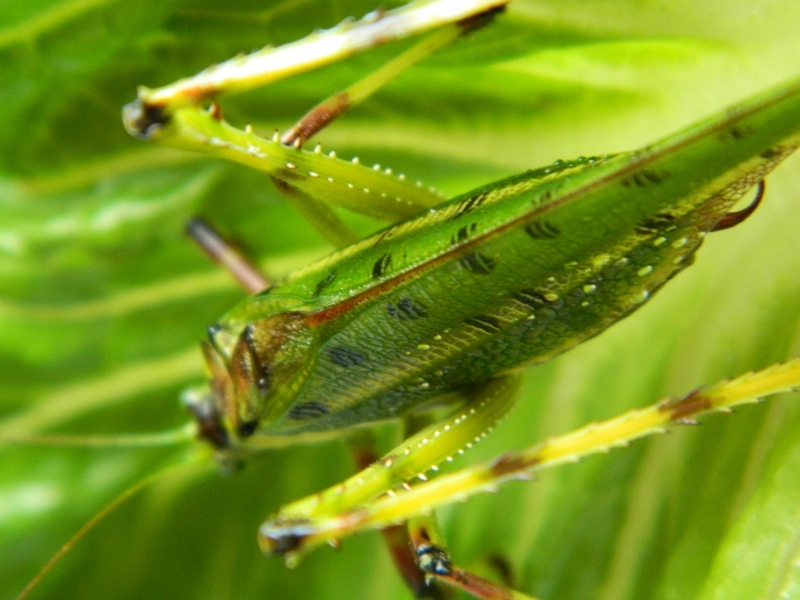 After all, they are not un-common, there are over a thousand species of katydid/bush crickets in Australia, and I like to think that my garden is somewhat of an oasis – so why hadn’t I seen one ? Then last night I heard a quiet chirp and a scratch of something against a fly-screen, so I grabbed my torch and went out to investigate … finally a katydid! And just the one I wanted to see, the 32 Spotted Katydid. 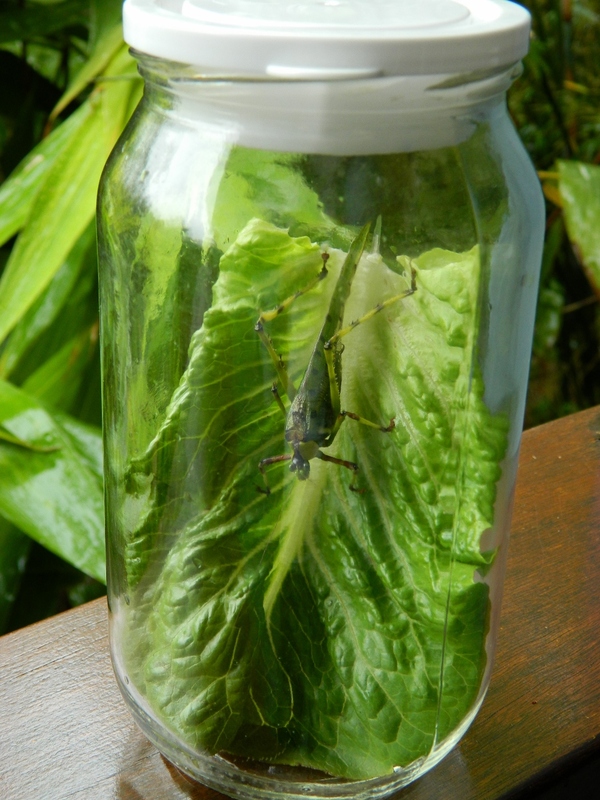 So I popped it in a big jar with a lettuce leaf (for a bit of atmosphere) and left it in the kitchen overnight. This morning I was able to study its beautiful markings and to count its spots – this one did appear to have 32 of them, but apparently the number varies. There are 32 spots – I counted! It seems that they tend to live at the top of gumtrees. I only have two and they are at least sixty metres tall – which probably explains why I haven’t seen them at ground level before. Perhaps the last two days of incessant heavy drizzle washed it from its perch? I have to say that its face reminds me more than a little of the extra-terrestrial in the movie Predator (you have to be an Arnie fan to have seen this one). But this creature is beautiful and far less threatening.